Gray Hair Treatment |Omega 3's that penetrate deep into hair follicles delivering nutrition and rejuvenating moisture to revive healthy pigment-rich growth. Help to keep your original hair color and slow or prevent gray and graying hair! Treat Gray Hair with Emu Shampoo & Conditioner & Restore Gray Supplements! Our best products to slow the on-set of premature graying and loss of follicle pigmentation. Topical and supplement amino acids, nutrients and proteins help restore pigmentation for darker hair. Emu Shampoo & Conditioner are loaded with Omega 3's that penetrate deep into hair follicles delivering nutrition and rejuvenating moisture to revive healthy pigment-rich growth. Help to keep your original hair color and slow or prevent gray and graying hair. Top selling hair products for gray hair treatment! A Complete Kit To Restore Gray Hair! Emu Shampoo for gray hair awakens pigmentation and helps restore color melanin! The loss of melanin leaves a gray/white void in the follicle shaft similar to albino-ism to skin. Emu shampoo for gray hair reduces the onset of gray hair and to promote growth of new, healthy pigment-rich follicles. Loaded with proteins! This advanced kit provides topical and oral nutrition to stop or correct loss of color, pigmentation and melanin - it's our best gray hair treatment! Restore Gray provides the necessary proteins, amino acids and vitamins needed to help reduce the loss of pigmentation and melanin - a primary cause of graying. Restore Gray is our best dietary supplement treatment for graying hair because it ensures you get the dietary supplements needed (yet overlooked) nutrients needed to guard against premature graying in women and men. Enriched with over 20 different botanical extracts, proteins, vitamins, and minerals, Restore Gray will target gray hair and white hair in both men and women. 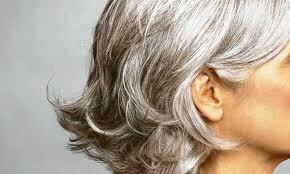 Studies have show that it helps restore gray hair with around a 70% success rate in both genders. A lot of factors can cause gray hair like diet, stress, smoking and alcohol just to name a few. Our best vitamins for greying hair! Restore Gray Vitamins help reduce and fade the appearance of Gray Hair!